I just want to go up to those poor lost souls, like some dress missionary, and ask "Sister, did *anything* about what you're wearing today make you happy? Or was it all about avoiding the possibility of unhappiness?" If you want to go to Chicago, you don't get there by going away from St. Louis, Cincinnati, Detroit, and Milwaukee … you get to Chicago by going towards Chicago. If you want to love what you wear, you can't get there by just avoiding things that other people hate, or that you fear they might criticize. Someone's always going to hate what you're wearing (and if it's culottes, or a Juicy Couture tracksuit, that person will be me). I think I love the near-matching of the plaid across the button-front as much as the sailor collar itself. It looks like the kind of only slightly triumphant effort that I would make, and then seek compliments on my wonderful plaid matching ability, despite all evidence to the contrary. Don’t you think it’s funny that Google has placed a juicy couture add on you page? I like your analysis very much. I think you are right on the money with this one. Amen, sister! If there was anything to take a firm stance on, it is dressing for joy.That and the fact that the death penalty is unfairly administered. oh, I *love* that there’s an ad for Juicy! Let them spend more money … Helen, do you think the plaid is really mismatched or could it be an artifact of the camera angle? I’m hoping for the latter. I was just thinking about this today when I purchased 5 yards of lipstick red fabric for a dress, despite the fact that my husband does not like red. I look great in red and wear it anyway. Funny that you mention the repurposed Twister mat dot fabric – I saw some this morning and was tempted to buy it for a dress, too, but there wasn’t enough on the bolt. I think of dress as a performance art, and not everybody wants to be on stage.That’s fair. The people in the drab boring clothes may be singers or writers or talkers, and may put their morning and evening energy where it makes them happiest. (They also may be stuck in professions which don’t tolerate self-expression. )Today, I am wearing an ankle-length straight shift in rose-violet batik, jade bangles, jade drop earrings, and silver shoes, because I *do* enjoy putting myself on stage. It was at Wal-mart, of all places. It was white ground, with kelly green, hot pink, a reddish pink, and yellow dots. The dots were about 1.5″ across and each was encircled with a thin band of one of the other colors. There was only 2 yards or so left on the bolt, and it takes at least 4 for a dress with a great full circle skirt. Oops, forgot, there were orange dots, too! “Strangers on the street (yes, even in New York City) will stop and compliment you. (And there’s nothing as nice as random validation from strangers! )”That happens to me ALL THE TIME in California and at work; it never happened in Charlotte. Sometimes you have to move to Chicago in order for people to appreciate your style.I firmly hold to the “if it makes you happy, it’s becoming” rule. A great dress, even if it’s not your color or cut, brings joy and therefore beauty. I wholeheartedly agree! I dress to make myself happy every day. I create stories and personas with my ensembles. I love discovering new combinations of separates I’ve had for ages. It makes me giddy to realize, for instance, that I just bought a blouse by chance that matches an underused necklace. Today I’m wearing one of my favorite outfits, a yellow, blue and orange plaid (yes, plaid!) short-sleeve button-up blouse with a yellow pinwheel skirt – but with brand new shoes, point-toed cornflower blue Keds with polka-dot grosgrain trim. And wearing them all together makes me absolutely jubilant. Last weekend, in a fit of spring cleaning, I finally took several bags of clothes to Goodwill and then immediately regretted giving up the plaid shirt I’d inherited from an old boyfriend. I haven’t worn it for years because it’s on the baggy side, but it did always make me happy. And seeing this dress today reminded me of my loss. It would be too ridiculous to try to buy back that shirt just to have it sitting in a bag in my closet again, wouldn’t it? Am I contradictory to your theory that I think I dress for joy AND I would be pissed if someone had on the same dress as me?I know I buy and wear what I like and what I feel like ON THAT DAY (with parameters that the outfit be apppropriate for the day’s activities). But part of my joy clearly comes from thinking I am the only one with that item or combo. ” Strangers on the street (yes, even in New York City) will stop and compliment you.”That’s a tad unfair to The City folks : )Spend a little time in NYC.. they are just as nice as the rest of the people in the world.And amen to joy and my swishy skirts! my reaction is usually along the lines of “hah! that dress looks better on me!” is that joy, fear, or egoisM?? If you think, upon seeing your doppelgnger, “OMG, I have to go talk to her, I bet we would get along great”? Joy.This is how my best friend and I met. Two women in High Victorian Gothic exclaiming “I love your hat! Did you make it?”If something doesn’t make me happy, I won’t wear it. I just found your fantastic blog. Please don’t mind me if I become a devoted fan and reader overnight! ps- I dress for joy usually, but sometimes sleepiness gets the upper hand. Oooo, I’m with Msbelle! I *squee* with joy when I meet someone who’s wearing something I’d like to wear, but wearing exactly what I’m wearing? Not so much so. Especially if it’s something I made. And it did happen once – or very nearly. I was in high school, and I was a guest at a wedding, and I proudly wore a dress I’d made myself: It was a hunter green Qiana (remember Qiana? ), with a low V-neck and a very fitted X bodice, with wrist-length gathered sleeves, and it ended at mid-calf. I walked into the reception with the young man whose date I was, and we were greeted by the sister of the bride. Sis had made her own dress for the wedding, too: It was a hunter green Qiana with a low V-neck and a very fitted X bodice, with wrist-length gathered sleeves, and it ended at the ankle. The only difference was mine looked great, and hers looked as if it had been made by Loving Hands At Home. I too have experienced the joy of having strangers in New York stop me to tell me that they loved my dress, and I have to say, it is indeed a really great feeling! I bought, on recommendation, Brenda Somebody’s book on building wardrobes, and it had exactly one useful piece of information in it, but boy, was it a good maxim: Buy the things you love, or you will be forced to love the things you buy. Sbanks, good for you! It took me years to get there. I love pink. My husband (my ex-husband) liked red, but hated pink. I love red, too, so I just stopped wearing pink. One day I’d had enough; I was making a dress (again, for someone’s wedding), and I made it in a lovely delicate pink floral. We were with a group of friends, and he said, “I really hate pink,” and I said, “Then don’t borrow it.” Wear what brings you joy. **Or even what brings you peace, if you regard clothes in a tuna-every-day sort of way; I too am a black shirt-pants-shoes person with food. Erin – I did have that sinking suspicion that your dots were ginormous, albeit in a happy, similing-inducing, I-wish-I-had-some-of-that-fabric way!La belladonna – Thanks! I’ve realized in the past few years that I need to buy what I love, as those are things I will wear with a smile, regardless of other’s opinion. What a wonderful attitude you all have – I’m torn because I’d love to wear clothes I love but mostly when I get up I just want to be warm/dry/comfortable (physically) and have not quite yet worked out how to blend the two. For example, all the lovely skirts I keep buying, I never wear because I walk miles every day and the shoes that look good with the skirts just aren’t comfortable for walking miles in. Any suggestions greatly appreciated… La belladonna, I LOVE your retort on the pink dress! Kate, I’d take a look at some of the new “fashion-y” Keds they’ve been marketing. Because they’re sneakers, they are comfortable, but cute enough to go with many a skirt or dress. And Erin’s favorite Jack Purcells often look good with vintage-style ensembles.Also, I’ve had some nice luck with a paid of Steve Madden cork wedges (only about 1.5″) this season. I can walk for quite a long while in them. Young children often demonstrate the joy of self-expressing through apparel. A little girl in my kindergarten music class today wore an ankle-length skirt of shiny rayon fabric of an Indian-ish print with sequins sewn on. As she twirled and twirled, her shirt came up, revealing an elastic waist pinned up to fit. It was clearly a garment made for someone much bigger. She, nonethelsss, was gorgeous and abandoned to the joy of her gorgeousness. I wish I could recapture that boundless delight in myself and in what I wear. Kate, try some comfortable ballet-style flats with your skirts. You will be sure to find just about every color available. And they are much more stylish than any sneakers I’ve seen. Erin, I just love what you’ve written today. I enjoy your writing very much in general, but I’m very excited by today’s entry.I agree with you so much about people dressing either (as I’d put it) to express themselves or to hide something. I love your postulation about fear versus joy. I also like the way you covered the kinds of comments people can get, and how you included yourself as someone who might not like something. You made yourself not scary, that way, to encourage people who like what you do to take the freedom to differ from you.I want to add a story. I’ve been moving toward dressing purely to express myself my whole life. The last few years, I think I am there. I’m 49. A few years ago, I made a pair of Betzina/Butterick straight-legged pants out of bright green children’s pyjama flannel printed with dinosaurs in primary yellow, red and blue. The pants fit great. Teenagers were wearing flannel pyjama-type pants then, which was not why I made mine, but the ones they were buying were usually in very dull plaids, and wide-legged and often low-crotched.I wore mine everywhere. One day I was grocery shopping in the very conservative, small Ontario town I get my necessities from. As I wheeled my cart out of the supermarket toward the parking lot, I heard a voice call out, “Your pants are really cool!” I looked, and saw a couple of teenaged girls sitting on the bench outside the store. One was grinning over to me, although she looked a little shy about how I might take her calling out to me like that. I thanked her with feeling. Then, just days later, I was this time swinging bags of groceries into the back of my CR-V when a woman of about 50 rushed over to me. She was not shy, and looked me right in the eye. “I just wanted to tell you how much I love your pants,” she gasped. “They’re GREAT!”And two years ago, I wore an ankle-length, favourite turqouise 4-tiered tie-dyed cotton skirt I made years ago to a journalism adult night class in Toronto. At one point I had to pass in front of the class for something and the wonderfully warm and (in my opinion) cute heavy grey woolen socks I was wearing loosened up and flapped off my toes as I was walking, sort of like duck feet. This was at a time when it seemed that everyone in Toronto was wearing tight black everything, including tight black shoes (and god-forbid stocking feet in public if you were over 6 years old). I felt a vibe coming across the room toward me that felt like, “Man, what a dork. Still stuck in the seventies. And LOOK at her socks!” Then, last year I wore the same garment to Toronto again. Tiered skirts were blossoming everywhere. This time, women rushed up to me smiling and begged to know where they could get a skirt like it! I said I’d made mine, but told them where I knew some were being sold. In two more years, when I wear it again, I’ll probably be judged (by some) as pass once again. But not by everyone. And who cares? I LOVE that skirt!Everyone should do what they feel like, if it’s for joy, and take courage. We could straighten a lot of stuff out in this world if we would act for joy and not out of fear. Good post, as usual. It has only been in the past couple of years that I have come to accept that long-sleeved black crewneck t-shirts give me joy, in spite of how my loved ones feel about it. In fact, I now wear a black t-shirt at least every other day. It makes me feel very Audrey, even though I have a torso like an oil drum. It frees me to wear any color/pattern/ cut I want in my skirts and trousers, and sister, I have some lovely ones. It is me and I am it. I know we all love vintage patterns here, but has anyone tried Vogue 2900 yet? I just bought some BLACK eyelet that will probably be lovely with some chuck taylors or a nice pair of flat mediterranean-style sandals. It occurs to me, after reading today’s enry, that all of my most favorite clothes have been near-costumes.My final sewing project in high school was to show “historical influence”. I made a wonderful pintucked Victorian blouse, tight sleeves buttoned from elbow to wrist and full in the upper arm, lace trim, mother of pearl buttons. I made an extra-credit garment, a matching skirt with soft pleats released from the waist. I found dainty crystal drop earrings, and my Mom knitted a stole to wear with it. I loved that outfit, and everyone raved about it. Even the teacher, who only gave me a mark of 99%, because she did not believe in giving 100’s. (And beleive me, that still burns! )My current favorite dress is a Burda pattern, a fitted bodice, very wide gathered, off-the shoulder sleeves, full long skirt and petticoat underneath. I made it of quilting fabric in a large morning glory print, and used a coordinate in a tiny print for the bodice. Tatted and beaded lace around the neckline, and a tiny amulet pouch hanging from a button at the side waist.I am not a little woman, but in this dress I feel fabulous– zaftig in the best sense of the word. There is alot of interest expressed, and I never see anyone else wearing the same thing! A funny thing happened to me on the way to lunch today. I’m wearing a dress almost exactly like this (http://www.forever21.com/product.asp?catalog%5Fname=FOREVER21&category%5Fname=tops&product%5Fid=2028874338&showBACK=OK#) in navy but with a peter pan collar and elbow length sleeves (and it’s from F21, too). It’s the first time I’m wearing it and I’ve been a little on the fence about it since I bought it. So, I went to my local Chinese place for lunch and there were too high-schoolish age girls behind the pick-up counter. They took my order and started speaking in their own language, which didn’t phase me that much. Eh, NBD, happens all the time in NYC. But then one of them said, “We were talking about your dress. It’s fabulous!” I thanked them heartily and we talked about where I got it and dresses in general while I waited for my order. How funny for this to happen today after reading this post! I’m slowly coming out of my dress for invisibility stage to the dress for joy phase and this blog is like a joy-reminder everyday. Erma, if you want to go buy that plaid shirt back, go and get it. It would not be ridiculous. I’ve regretted giving stuff away that I still loved because sometimes the desire to wear something comes in phases that are years apart. I think some of us may just wear and love things in cycles like that. Suddenly, here that feeling comes again and an item that had nearly been rejected resumes its status as a favourite. Figure out, if you can, whether you really want it or really want to let it go. But don’t judge yourself for wanting to go and retrieve it.I also want to add that I have a dear friend who is 64. She has waist-length, wavy, undyed golden brown hair, wears fitted jeans on her well-defined legs, and one of her favourite tops is a pumpkin orange tie-dyed hoodie with a soft, wide indigo stripe across the bust. She used to carry her reading glasses in a hand-beaded deerskin knife sheath belted to her waist as she walked around the university where she teaches. Words to live by! (In addition to the helpful wallet card, I think “Hate the sin, love the sinner, invite the sinner dress shopping” needs to be a t-shirt at the very least. )There’s this fabric I’ve had for at least six years – vintage teal cotton, with hexagonal clusters of green, raspberry and blue dots. This spring, I finally overcame my fear of cutting it and made myself a skirt. A huge, gathered, poofy skirt – just the sort of thing that someone like me, short and plump, should not wear. But I love it! And despite some initial reservations, I took it for a spin earlier this week (during a brief respite from the rain here in New England), and obviously the joy-in-dress factor was in play: I got plenty of compliments, and felt fantastic. So add me to your Ministry of Wear What Makes You Happy! Greetings from the land of khaki!Everyone here looks like they stepped out of a Lands End Catalog – which is fine if it makes them happy! But they’re mean….clutching their Starbucks in one hand and cellphone in the other – veins popping out of their necks as they rush to get little Caroline to ballet and Ted Junior to soccer practice….oh, if only they’d worn a lovely skirt or vintage cowgirl boots or lacy gloves perhaps they would be happy – I know I am. One of my little ballet students asked me to come over on her birthday so we could wear our “shiny shorts” and dance together! Long live girls who wear shiny shorts! I salute thee, and my ridiculously short cherry-print Luella skirt. All hail crazy individuality. Wow. I’d never have thought I’d love a post about clothing (ok,about dressing,ok, about individuallity) so much. I recognize myself as pure joy; though somtimes using fear (to ward off my mother – that’s legit, innit?) and, predictably, not feeling happy in these instances. When are you going to be at Housingworks? I’ll show you joy. Yes! Yes! Yes!Sometimes I dress to look good, but much more often I dress to amuse myself. And whenever I’m cleaning out my closet, I try to remember to ask, while considering each item, not “Do I actually wear it?” but “Does it make me happy?” Of course, this results in my keeping some things that I hardly ever wear, but I’d rather risk that than have a closet full of purely practical things.Do I care if what I wear pleases other people? Well, that would be nice, but I’m well aware that a lot of the ensembles that amuse me are “don’ts” to some–wearing pink and red at once, for example, which I did today. Lots of it. With a black-and-white polka-dotted top.Kate in England: I recommend Danskos, if you have those in the UK. I’ve got several pairs that look cute with skirts (Fran, Arabella, Lara, some discontinued ones), and I can walk three to five miles in most of them, no problem (without socks!). Love your post today Erin. Iam with bbrug she said how I feel the best of all the posts. Crocs has designed a ballet looking shoe the style is Prima. You can find it on the web but the shoe is not really out till this summer. I hope they get it in more colors. I would like a few pairs. If someone was wearing one of my outfits I love. I would have to go talk to her pick her brain about clothingI like this plaid dress you posted today . I would wear this dress. Kate in England–make sure the Danskos have a nice rocker bottom. Most of the newer fashion ones do. The Professional has a flat bottom that is good for standing in but lousy for walking any distance.I wear my Danskos all summer under my Victorian clothing (buzz off, I’m an entertainer, not a re-enactor) and never leave the grounds footsore. 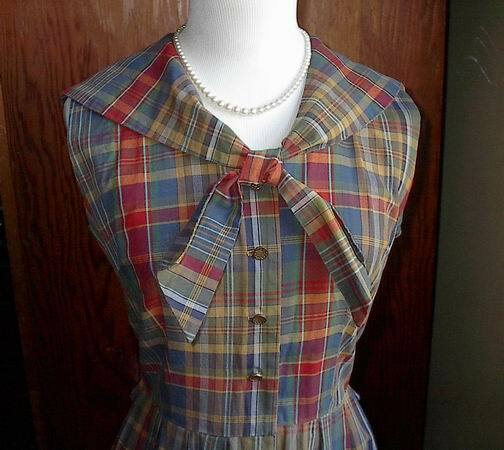 I went over to look at the dress.The plaids are mis-matched around the buttons and the skirt does not line up either. I cant buy this. I will have to look for a pattern and some nice plaid fabric and have one made.Kate in England: You said you have to walk a lot of miles. You could do like the girls at Nordstorms used to do in the 80’s. Carry the shoes you want to wear in a bag, till you get where you are going to. Wear the very confortable ones till you get there. I dont if this will work for you or not. it’s cute. i love the collar. i do not mind about the mismatched-ness. it adds to its charm! I met one of my closest friends when I was sixteen. We met wearing the same dress. I assumed she had amazing taste. Thirty-two years later, we’re still best of friends. I had coffee with her last night. She lives 2100 miles away from me and was in town visiting relatives. I’m a mom who dresses entirely for comfort, so I don’t dress out of either joy or fear (and I am totally okay with that!). Someday when I’m back in the professional world I’ll dress better…but the comment about culottes brought back a memory of a pair I had in 6th grade that my mom made for me. They were made from a print fabric covered in polka dots and watermelons. What WAS I thinking?! !